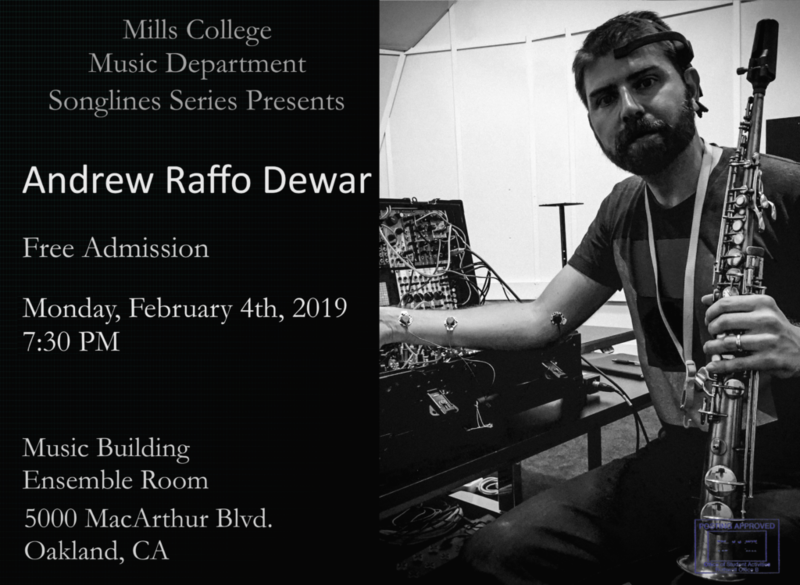 Composer/saxophonist Andrew Raffo Dewar will be at Mills College Center for Contemporary Music on Monday, February 4th, 2019 to perform his work, Ghosts in the Uncanny Valley II — a 35-minute composition for acoustic quartet improvising with live electronics programmed in the Kyma sound design environment. Kyma analyzes, manipulates, and expands upon the sounds of the acoustic instruments in real time, creating an electronically “extended” (and altered) quartet. The quartet features the composer on sax, Gino Robair (prepared piano), Kyle Bruckmann (oboe/English horn), and John Shiurba (acoustic guitar). On January 31st 2019, Dewar will be at the Santa Monica Library to perform the premiere of his new piece for soprano sax and Kyma as part of their Sound Waves series. This performance starts at 7:30 pm and is free and open to the public.